My intention and foundation for my work is to depict the reality that we are nature and not separate from it. Whether I’m working on a sculpture or a painting, I love textures and often enjoy building a painting upon musical scores and lyrics as well as textural effects and of course color patterns that draw the viewer in and call to physical touch as well as engaging spiritual, emotional and intellectual curiosity. I owned and operated a lovely gallery here in Big Sur and after six wonderful years I closed following the fires in 2008. The magical Dome Gallery & Studios and my home was once again my base of operation bringing much inspiration and motivation. It's also known as The Jewel in the Forest where I’ve built a stage, gallery, and studio. I welcome people from all over the world to visit and attend gatherings, workshops, retreats and weddings. ​Lodging may be available for workshops, personal retreats and gatherings. I have always felt that I was "led" to Big Sur through a long list of "coincidences" that began on the day after I'd visualized my perfect home in the forest next to a stream. Of course at the time I didn't see it as a possibility but miraculously found myself living here in 1995, immersed in profound natural beauty. After a few months I realized I had changed and wanted to get back to my art. I miraculously found myself living in Big Sur in 1995 and after living in profound natural beauty for a few months, I awakened one night with an ecstatic Vision. I witnessed vibrant color patterns, faces and profound imagery emerging from these majestic patterns. I was moved to ecstatic awareness as I gazed into a holographic vision of time and space. Thus began “Essence Portraits” and now, thousands of portraits later I continue in my journey with art as a medium through which I derive information, guidance and inspiration. 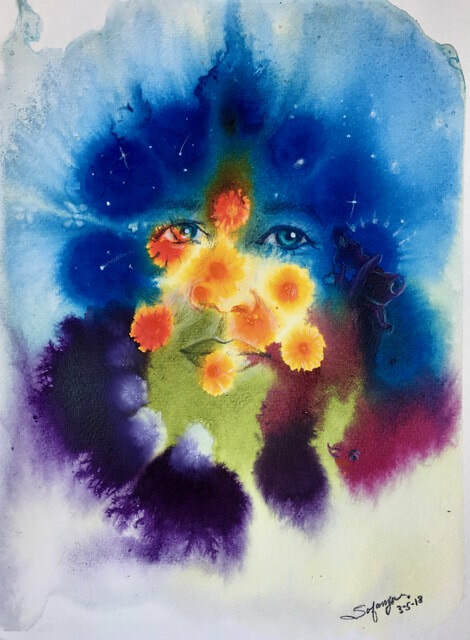 Essence Portraits are an inner landscape in a kind of hologram of time and space as one peers into the patterns. I also provide a “guided interpretation” along with the portraits. I am available to do these Essence portraits either at my studio in Big Sur or from a photo sent via email.